CPR training manikin upper body. This professional use CPR training manikin is packed full of easy to use features to deliver realistic CPR training. The unit itself offers many benefits to owners, operators and students. Fast and simple clam-shell torso that accommodates and easy to install face shield lung bag for minimum fuss and set up. 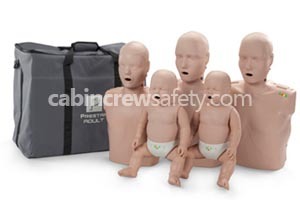 This unit is sold singularly but for class training purposes a multi-pack of four is offered as well as a CPR training family pack for CPR instruction on replica infants and children. This cpr training manikin upper body is supplied as un-certified representative training equipment. 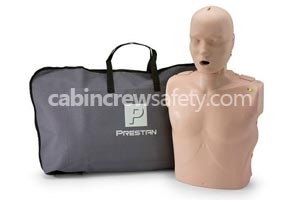 Looking for a CPR training manikin upper body for flight operations end use? We're here to help with all of your equipment needs. Not only with this CPR training manikin upper body but any other parts, equipment and reference training devices that you may require.